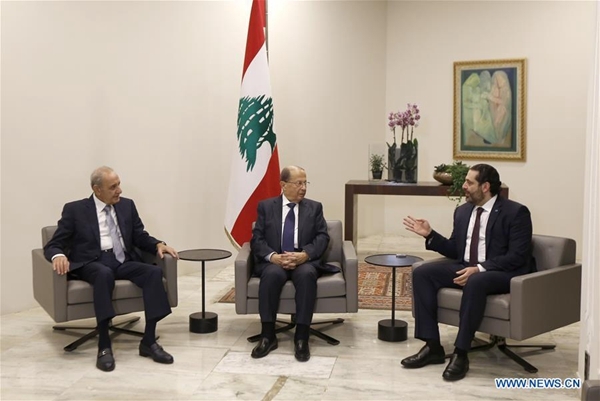 Lebanon announced on Thursday the formation of a new government, breaking a nine-month political deadlock in the country, local TV Channel LBCI reported. In a televised address, Fouad Fleifel, secretary general of the council of ministers, said Lebanon finally succeeded in forming a 30-member national unity government headed by Prime Minister Saad Hariri with all main political parties represented as promised. Hariri's Future Movement will be allocated six ministers, the Free Patriotic Movement 10 ministers, the Lebanese Forces four ministers, Hezbollah three ministers, Amal Movement three ministers, Progressive Socialist Party two ministers, and one minister for Marada and the Consultative Gathering respectively. "We finally succeeded in forming a government. Our duty, first of all, is to apologize to all the Lebanese for the delay in forming the government," said Hariri following the announcement of the new cabinet. He guaranteed that all ministers will work together to overcome the financial, economic, social and security challenges facing the country. "The government has an agenda that cannot be delayed further and no one can ignore the problems facing this country," the new prime minister noted. Hariri also emphasized the need to implement real and serious reforms. "The international community has pledged to offer 11 billion U.S. dollars for Lebanon but the fund cannot be delivered without the implementation of real financial and economic reforms," he said. Lebanon has struggled to form a government since Hariri was designated Prime Minister last May following parliamentary elections, mainly because of the differences among the parties over their representation in the new government. Hezbollah, a Shiite political party, and the Free Patriotic Movement, founded by Lebanese President Michel Aoun and currently headed by Foreign Minister Gebran Bassil, had demanded to grant cabinet representation to a group of six Sunni lawmakers who are known as the Consultative Gathering and not affiliated with Hariri's Future Movement. The Consultative Gathering finally succeeded in having Hassan Mourad, son of one of the six Sunni lawmakers, appointed as Minister of State for Foreign Trade and its representative in the new government. Lebanon announced the formation of a new government, breaking a nine-month political deadlock in the country.